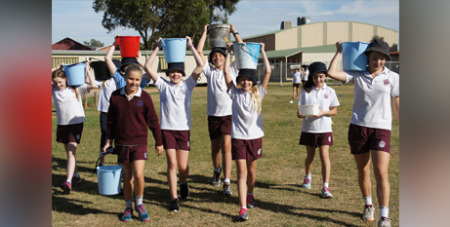 Today is World Water Day and school students will be fundraising for Caritas Australia’s Project Compassion campaign using buckets and recycled water. Funds raised from the Water Challenge will help support humanitarian aid programs and to drive change in communities experiencing poverty globally. For the past week, participants in the challenge have been saving water wherever possible - such as during showering or cleaning their teeth. The aim was to save five litres of water each day. Today, Caritas is asking supporters around Australia to collect up to five litres of water in a bucket, and walk up to three kilometres to show solidarity with children around the world who don’t have immediate access to clean, safe drinking water.